East Stour Village has a large village hall situated next to the playing field in the centre of the village. The address is Back Street, East Stour, SP8 5JY. For more information or to arrange to book the Village Hall, please contact Sheila Squire on 01747 838488 or use our online form. The hall hosts many of the local activities and events and is the meeting place for most of the local village clubs and societies. The hall has a kitchen, a meeting room with hatch to the kitchen and a very spacious wooden-floored main hall area, marked with a badminton court, and a stage. Full details of the facilities available can be found by clicking on the “Information Fact Sheet” link below. The following documents contain details about hiring the hall for events, along with the regulations and application form. East Stour Village Hall was opened in 1973 and a major refurbishment was completed in 2016. This included redecoration, extensive new flooring, new curtains and blinds for all windows, electric heating, new stage lighting and curtains (front and rear), and extensive acoustic panels to improve sound. Over £25,000 was raised through a variety of enjoyable social events over the last two years, including £10,000 from the Big Lottery towards the heating costs. The improvements to the Hall also marked the end of the Village Action Plan. This started in 2013 and was developed out of the East Stour Village Plan. Twenty two Actions were achieved, including this village website, planting 9,000 daffodils in roadside verges, renovation of the central phone box into a lending library, a defibrillator at the village hall, wild flower meadow from an overgrown parcel of waste land on the A30, weekly coffee morning, oil buying consortium, yoga class, benches trees and bird boxes on playing field etc. East Stour had lost 18 men to the slaughter of The Great War, 1 more was to die. After the carnage had ended, East Stour decided not to have a traditional memorial, but to build a snooker room where the veterans could meet. 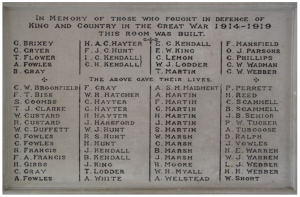 In that room was a stone plaque showing the names of those who served and came back and the names of those who died. That plaque is now in the entrance porch of the village hall along with the plaque commemorating the three lives lost to the Second World War. To commemorate the 100th anniversary of “the war to end all wars” East Stour has a new war memorial. It is a human sundial located in the playing field, near the village hall. 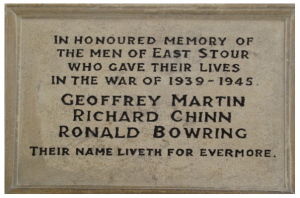 It has been created entirely through donations and is dedicated “to everyone from East Stour who has been affected by war”. This non traditional memorial, we hope, will engage generations to come to stop and think. Memorial day is not just about remembering those who died many years ago, but about remembering the mums, dads, sisters and brothers and the wider family who suffered grievous loss and also those who came back. Those that survived were often wounded physically and mentally, causing yet more grief and pain lasting many years after the guns fell silent. Details of the memorial plaques can be found here.